The Hollingsworth cousins gathered once again during the first week of May for a great reunion, visiting sites in both South Carolina and Georgia. We headquartered in Columbia, SC, and our first Murphrey-Hollingsworth Cabin at Hagood Mill Site day of adventure on Thursday was to Pickens County, SC, where we initially visited the Pickens County Museum of Art & History for a taste of the local culture . Lunch was on our own in Pickens before boarding the bus to head to the Hagood Mill and Murphrey-Hollingsworth Cabin. 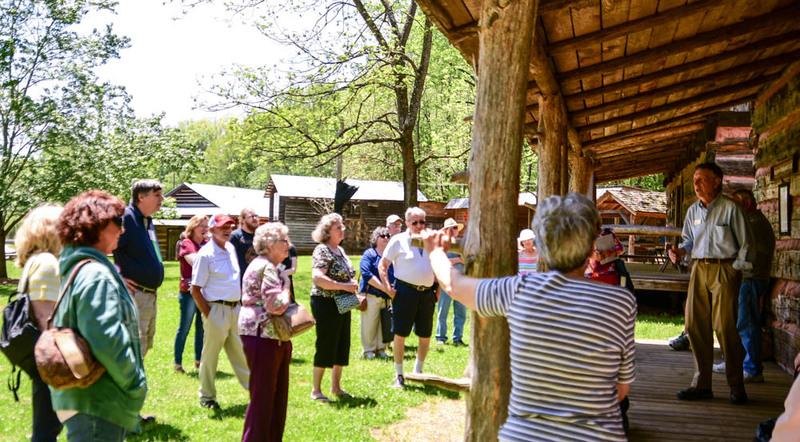 We were met at the site by our guest speaker Billy Crawford, who filled us in on the history of the mill and the cabin, once owned by an early pioneer Hollingsworth family. After exploring the site, we returned to Columbia for dinner on our own. Day two saw us boarding the bus for our trip to Augusta, GA. First stop was the Augusta Museum of History, where we had a guided tour that walked us through years of Augusta history. Following our tour, we were treated to presentation on the Hollingsworth Candy Company, a treaured fixture in Augusta for most of the 20th century. Speaker Bill Baab kicked Speaker Julie Berry & Past President Jo Hollingsworththings off with a history of candy making in Augusta, followed by a terrific presentation by Julie Berry, daughter of the company's chief engineer, on the history of the company with lots of pictures from the company while in operation. From there, we travelled a few blocks to the Augusta Canal Discovery Center, for our Canal Boat ride. 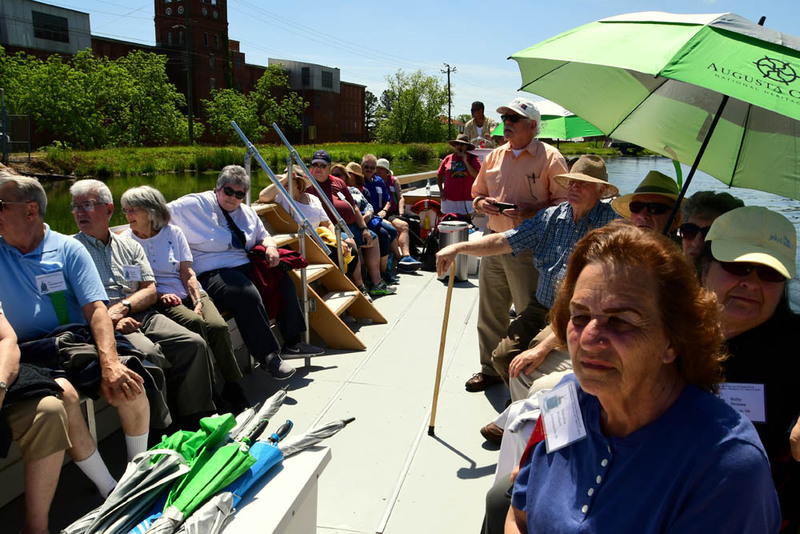 For the next hour we motored up the canal and back, learning about its vital role in the history of Augusta and the surrounding area. After a boxed lunch at the on-site Fat Man Cafe, we boarded the bus for a Sardis, GA and the Sardis Baptist Church. The Church was co-founded in 1803 by Jacob Hollingsworth, and pastored in the 1950's by Rev. Troy Hollingsworth, bookending the long history of the church. 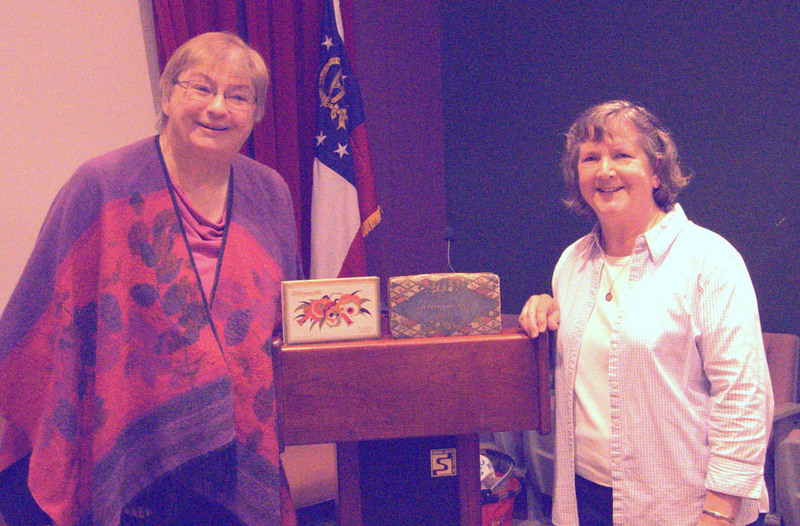 Our VP Randy Hollingsworth and Georgia Hollingsworth researcher Lillian Talbert gave a presentation on the history of the church and on the ongoing research into Riding the Augusta Canal Boatthe genealogy of the early Georgia Hollingsworths in the area. It was then on to the beautiful General Elliott Inn in Akin, SC, where we had a terrific dinner amidst the rolling countryside of the self-proclaimed polo capital of the USA. 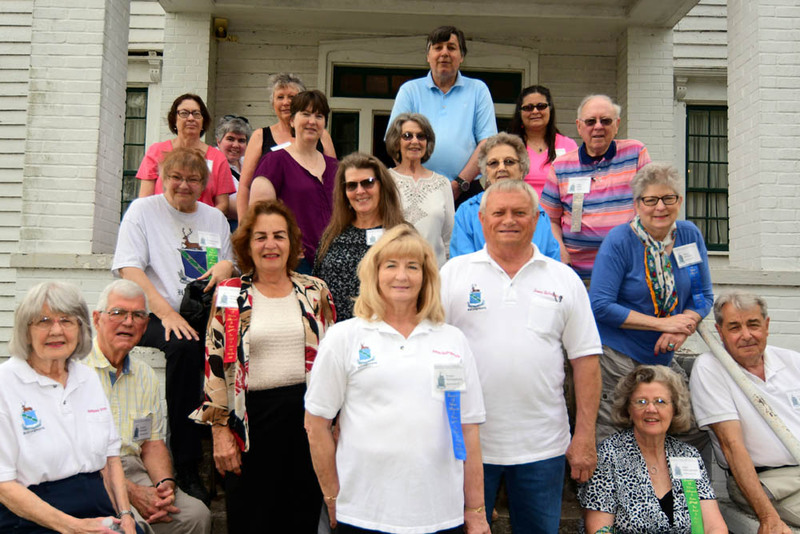 Day three started out at with a carpool to Newberry County and the Newberry County Museum, which is located in the Coppock House and also includes the Gaunt house a few steps away. The museum has an impressive collection of artifacts and displays, relative primarily to the history of Newberry County and the Gaunt House provides a glimpse into the setting of a dwelling typical of the county in the early 1800's. Following lunch on our own, the group drove to the Bush River Quaker Cemetery. 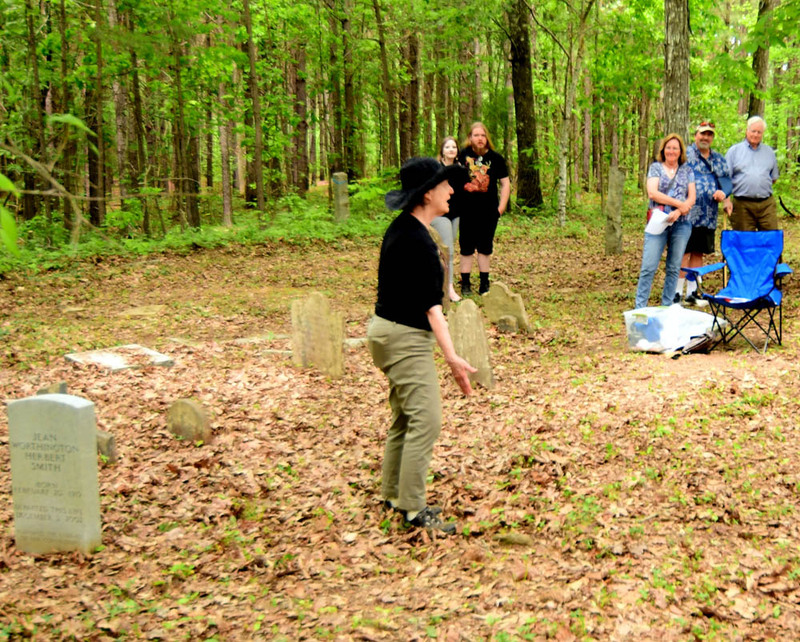 We were fortunate to have Judy Russel speak to us about the history of the cemetery and the efforts starting in 2002 to reclaim the cemetery from nature after years of neglect. Today this final resting place of many of our groups' anccestors is a well maintained Reunion attendees at New Berry County Museumand peaceful setting. After the drive back to Columbia and dinner on our own, our reunion concluded with our annual business meeting, which was kicked off by an inspiring talk by James Willbanks, author of the recently released biography of Lt. General James F. Hollingsworth, call sign Danger 79er. Bush River Cemetery TalkThe reunion was a great opportunity to catch up with cousins we have known for years and also to meet new cousins attending for the first time. For those not able to make this year's reunion, we hope you will join us next year in Delaware, where it all started, for our 2019 reunion.